Deer Creek Structures a family owned and operated business where we specialize in building top quality, affordable, portable horse barns. Best of all, we deliver them already built and ready to use! Deer Creek Structures is a family owned and operated business that started in 2005, and our high quality, portable barns and shelters offer the perfect addition to any property that houses horses. Made in the heart of Texas, these quality wooden barns and run-in sheds are perfect for all types of horses. They will allow your horses to be in a safe, secure place when they need to be. Beauty, quality, durability, and made to hold up to the rigors that horses are know for, Deer Creek Stables has the right barn for you and your property. If you are looking for small horse barns for sale online, you will find the best ones at Deer Creek Structures. These quality horse barns can be delivered to you if you are in Texas or the surrounding states. Your horses will love to use our beautiful shelters, and be kept in horse barns that are just the right size for them. Now your horses will not have to share the same barns with any other type of animal. Shedrow Barns: Many of us are blessed with a home where we can relax, decompress, have our quiet moments and, most importantly, escape a cruel world with its cold snaps, rain, sleet, snow, etc. Without a home of some kind, life just isn’t healthy. Our horses deserve a healthy life too, which is why Deer Creek Structures proudly offers portable shed row horse barns for sale; it is a way to give the horses on your ranch the healthy life that they deserve. These Portable Shed Row Horse Barns come in two sizes – 10 FT and 12 FT. They are great for any kind of horse and, made with hardworking American craftsmanship, will last you a lifetime. Aisle Barns: As any horse owner or rancher knows, land can become clustered pretty quickly; what starts off as just a few animals can suddenly explode into many. If possible, it is conducive having all horses and other livestock in one general area so you can keep an eye on everything. Portable horse and livestock aisle barns from Deer Creek Structures will accomplish all this and more. A great feature of these aisle barns is having everything under one roof giving you ample stall and tack room area plus a generous 10′ or 12′ wide aisle to work in. Dutch doors can be added to the back of each stall to give you outside access. These aisle barns will open up your property in ways you never thought possible! Run In Sheds: Horse owners know that portable run-in sheds are great additions to any ranch or large property. 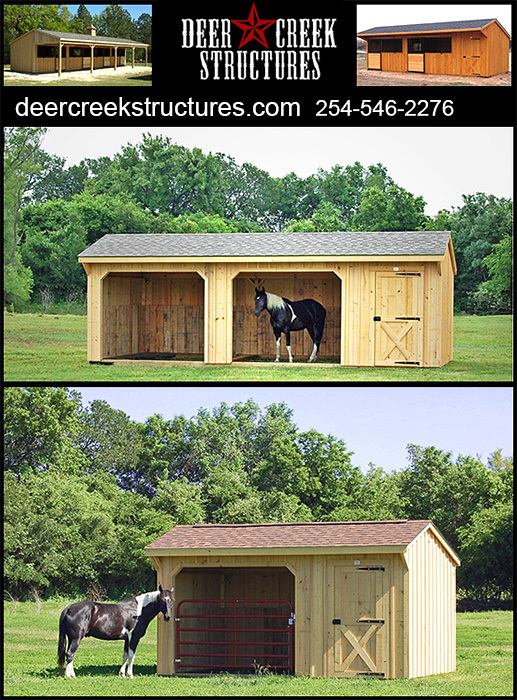 Texas portable run-in sheds from Deer Creek Structures are perfect for all types of horses. We love horses just as much as you do and are pleased to provide you a safe and secure way to move your beloved horses around. These aesthetically pleasing run-in sheds come in three sizes – 8 FT, 10 FT and 12 FT. No matter the size though, each run-in shed meets the high standards that Deer Creek Structures has set for itself and is made with only the best materials right in the heart of Texas. We start with a basic model and work with you to build the shelter that works best for your situation. You can customize your barn to include a tackroom, which allows you to keep your saddles, feed, and hay right where you need them. We can also add gates and divider walls to let you use your run-in shed as a stall, in case you need to keep your horse confined for some reason. Our Run-in sheds are designed and built to be fully portable, meaning that we build the barn at our shop, and deliver it to your site, fully assembled and ready to use. This system also allows you the opportunity to have your barn picked up and moved to a new location, whether it is 2 miles or 200 miles down the road. Is It True That Deer Creek Barns or Run In Sheds Arrive Already Built and Ready To Use? YES! This is a big difference between ourselves and many of our competitors! Our barns are built on pressure treated 6x6 skids, which are actually part of the framework. This allows us to build the barn at our shop, load it onto a trailer, and deliver it to your site fully assembled and ready to use. These barns can also then be relocated in the future as needed. Is It True That The Barns and Run In Sheds Are Completely Portable and Do NOT Require A Concrete Foundation? That is true! Our standard line of horse barns and sheds will be completely portable. The barns will have a 16" -42" overhang, and does not need to have any concrete foundation. We can build from an 8x8 up to a 12x48 horse barn in a one piece, portable unit. NOTE: We also offer 6'-12' overhangs for an addition to any of our barns. Along with our Aisle barns, these shedrow barns with the larger overhangs will require concrete piers as a minimum foundation to set on. Delivering a portable barn on your property can have its challenges at times. Beings that we need a good amount of room to maneuver with our truck and trailer to set the barn, sometimes it is necessary for us to build the barn onsite. If you think it may be a tight fit to deliver a barn on your property, we will work with you to determine which option of delivery is best. What If I Want The Larger Overhang For Protection From Sun, Wind and Rain? When building a barn with a larger overhang, we use 6x6 posts in the front, laminated beams, hurricane ties, and anchors to attach the barn to the foundation. This allows you to have the peace of mind knowing that your horse will be living in a well built, solid stable. What Do I Need To Do To Help With The Delivery? Deer Creek Structures has its own fleet of delivery trucks, and will work with you place the barn where you need it. Most times, all you need for the site is a flat, level are on which to set the barn. Call Deer Creek Stables For Your Barns and Shelters Today! Working together as family here at Deer Creek Structures allows us to build these barns with quality, and ensure that you are taken care of from start to finish. We are horse people too, but most of all we are craftsmen that know what it takes to have a great, durable barn to last for years to come. Give us a call today— we won’t disappoint you!